Single Breasted. Waiste: 34. Inseam: 29. C. Waist: 40. Length: 40. Condition Notes: Excellent pre-owned condition. No tears, stains or other defects. Full canvas design with pick stitching around lapel and all trim. Trousers are full cut double pleated design with no bottom cuffs, does have an extra 4" to let out and make a cuff if desired. Both jacket and trousers are fully lined. Weight 50 oz. Extra fabric to let out of inseam 1". Any spots are due to lighting and not the actual item itself. I am not responsible for any odors. Clothing is used and may have odor. Color / Pattern: Gray with Blue Pinstripes. STAFFORD Washable Wardrobe Gray Pinstripe Suit. Stafford's Excellent Quality, Comfort & Style. Hook & Bar Double Button Closure. Trousers Are Double Pleated & Cuffed. Excellent Condition. Wool & Cashmere. Measurements: (Front) Armpit to armpit 24", Across Waist 23", & Shoulder seam to cuff 25". (Back) Shoulder to shoulder seam 21", Bottom of collar to bottom hem 33", & Mid neck to cuff end 33.5". Pants are pleated front 40" Waist × 29" Length. Excellent Condition = No rips, stains, or defects seen. Try checking out our closet. All items are from smoke & pet free environment. Thank You! The shirt and tie are for display purposes only and are not included with the suit. Flat front pants. chest: 46". length (bottom of collar to hem): 31". 2 buttons down front, 4 on cuffs. 3 front pockets. Shoulder seam to shoulder seam: 20". shoulder seam to cuff: 23.75". Very detailed wool pattern can be seen in the 2nd picture. Hard to describe in words; looks amazing in person. inseam: 29". Inseam (crotch to cuff) 29.25" (3.00" to let out). Waist (laid flat) 20.00". 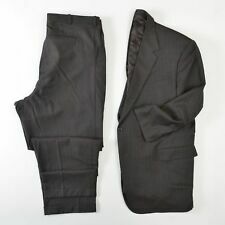 ZILLI ® AUTHENTIC 44R Navy Blue Pinstripe Suit Pleated Pants 40x29. Pants (PLEATED FRONT). Color:Navy Blue. Mother of Pearl Buttons. Cuffs:3 Button. This item has been well inspected. It is in good condition. Single Breasted. Inseam: 29. D. Shoulder: 19. Condition Notes: Excellent pre-owned condition. No tears, stains or other defects. E. Sleeve: 25 3/4. A. Length: 31. The fabric is primarily a black wool. Trouser Waist: 40" / 1" extra to let out. Jacket Waist: 45" (narrowest point - usually near the top button x 2). Chest: 47"(armpit to armpit, widest point x 2). Shoulder: 20 1/2". Material: Beautiful 100% Super 160's Wool. Pattern: Pin-Striped. Color: Nice Blue Pin-Striped. Shoulders ( Seam to Seam ) 19. Waist ( At Pockets) 21. Sleeve ( Seam to End) 25. I am always getting new inventory so check often. 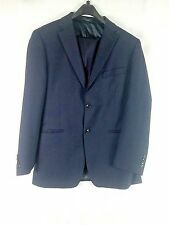 This is for a pre-owned suit BROOKS BROTHERS 346 STRETCH ASH HOUNDSTOOTH DESIGN JACKET IS A 2 BUTTON WOOL 41R PANTS SIZE IS 35 X 29 PLEATED FRONT. Sleeves can be lengthen - 2 approx. - 97% WOOL, 3% LYCRA. Fabric:51% silk, 49% wool. Colour: gray, stirpped, darker than appear. Size: I 60R (XL, EU cca 54-56). Sleeve lenght from shoulders: 67cm= 26. Inseam: 74cm= 29. Two button closure. Length from pit: 52cm= 20. Size : 40R. This is a great JOS A BANK glen plaid suit. Features dark blue glen plaid pattern. JOS A BANK BLUE GLEN PLAID WOOL 2 BUTTON SUIT WITH 34" PANTS. Color: DARK BLUE - GLEN PLAID. with 2 button front and 4 button cuffs. It is black pinstripe wool suit. Long Sleeve. condition A- I see no flaws. Bulloch is a very fine custom tailor. This is a made-to-fit suit and therefore 42R is an estimate only of the jacket size. Sold AS-IS. -Inseam: 29" with 3-1/2" of spare fabric to make it your length. Inseam (crotch to cuff) 29.125". Waist (laid flat) 20.00". Inseam (crotch to cuff) 29.00". Waist (laid flat) 20.00". Sleeve length: 24". Length: 30.5". The pants have a pleated front waist. Shoulders: 18.75". Inseam: 29". Previously owned, like new NobleHouse excel Giorgio Vallino Super 130's 270 G/M. Suit was custom tailored. Hart Schaffner & Marx solid black 100% Australian wool suit has a classic " Chicago" fit. Chest Width: 22". Length: 31.5" from base of the collar. Sleeve Length: top of shoulder- 24.5", inseam-16.25". ANDREW FEZZA Super 100's. Right: 3 including breast, pen and lower pockets. This suit is in beautiful condition. Top of collar seam too bottom hem -31 1/4". Size 40 waist. Double Pleat Front. 2 back pockets (one has button closure). M en's 44R 100% wool grey plaid suit in very good condition. Size: I58 UK 58 US 48R (EU 54) - XL. Colour: blue, darker than appear. Due to different monitor and light effect, the actual colour of the item might be slightly different from the color shown on the pictures. Inseam (crotch to cuff) 28.50" (2" to let out). Waist (laid flat) 20.125". Inseam (crotch to cuff) 28.50". Waist (laid flat) 20.25". Luigi Borrelli Suits. SIZE 46/56 Luigi Borrelli. Closure Style: Double Breasted - 4 x 2. Pant Waist: 40". Color: Navy Blue. EU Size: 56. US Size: 46. Pant Lining: Front lined to the knees. TYPE : GREY STRIPE 2B 1V. PATTERN: STRIPED WITH SUBTLE BLUE AND RED LINES. NUMBER OF BUTTONS: 2 FRONT / 4 SLEEVES GREY SWIRL. LINING: FULL CANVAS. THE SHIRT AND TIE ARE NOT INCLUDED THEY ARE ONLY THERE TO DISPLAY THE SUIT. Cuff Height (height of cuff) N/A. Arm (shoulder to cuff) 24.50". Inseam (crotch to cuff) 29.375" (2.5" to let out). Shoulder (seam to seam) 20.375". Waist (laid flat) 20.125". The jacket has hole on the right sleeve down near the cuff and it also has two small holes on the back of the right shoulder. As a result from the alterations being removed you can now see the holes that were left behind when the thread was removed from the pants. Inseam (crotch to cuff) 28.50" (2.50" to let out). Waist (laid flat) 20.00".